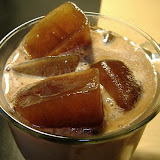 Morning Coffee & Afternoon Tea: Kitsch or Kewl? 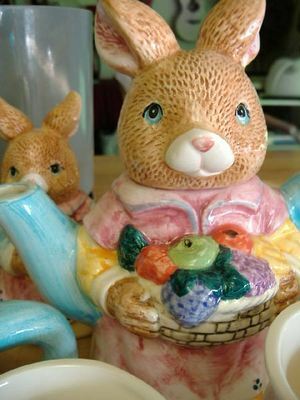 I can't decide if this wabbit fambly tea set is cute-and-collectible or just gawdy-but-good-for-a-giggle. It was a gift from somebody who figured I needed more tea sets for my collection, so I'm loathe to throw it out. 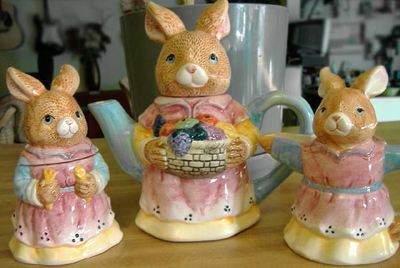 It's a complete set - teapot, creamer, sugar bunny, 4 cups, saucers and little spoons. Momma wabbit's head comes off, as does sugar bunny. It gave me a great chuckle when I unwrapped the box, and I do love bunny wabbits, but could I actually leave it out and serve tea with it? I dunno, whaddya think ... kitsch or kewl? For a themed tea - lovely! I have an adorable wee set of plaid scottie dog cups. Unfortunately, it's too tiny to actually use. I wish I could use it all the time! Enjoy your tea set! I dunno, whaddya think ... kitsch or kewl? They sure are different-I have never seen a tea set like that. They look very nice though and would look festive for Easter. I agree, kitsch can be kewl! It's a great conversation piece in anycase! Who cares if people consider them kitsch, be an individual.. I think they are gorgeous and I would definitely use them, maybe for a "Easter" high tea just for fun. Who cares if people consider them kitsch, be an individual and "make your mark". I bet evryone would love it....smile....or, if you are a bit "chicken" LOL you could use them for a kids party anmd serve a special drink out of them....maybe chocolate or milo....have fun, life's too short to be "careful.....I love your site by the way, came accross it looking for my long lost microwave lemon curd recipe. I always say...that if you have to ask yourself that question then they should head out to good will. Usually, if I really LIKE something I don't give a crap if anybody else thinks it tacky. I would say kitsch! But kitsch can be cool, depending on context. I never like popping heads off of things though, might be better on the shelf. I found your site looking for info on Victoria mag. Aww.. I missed the competition. Good idea! Well, I have to admit they're "cute"--but please don't ask my Wonder Woman what my face looks like when I say that word. Of course, as an accompaniment to a collection of Peter Rabbit things, they might be slightly other than "cute". It reminds me of my parrot tea pot. A gift I kept and dispaly proudly on my china cabinet. love the rabbit tea set! love the rabbit tea sets! I think it's all in how you present it.